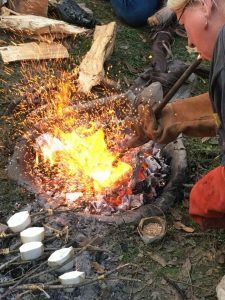 Posted on 02/02/2018 Categories About me and my workTags archaeology, archaeometallurgy, bronze casting, casting, EXARC, experimental archaeologyLeave a comment on Now we’re Cooking with Gas! 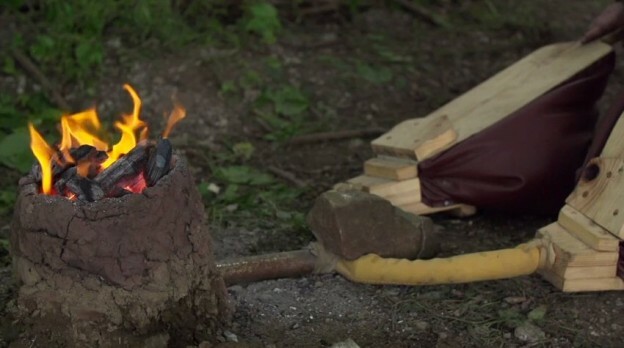 How experimental archaeology challenges modern assumptions about metal recycling. 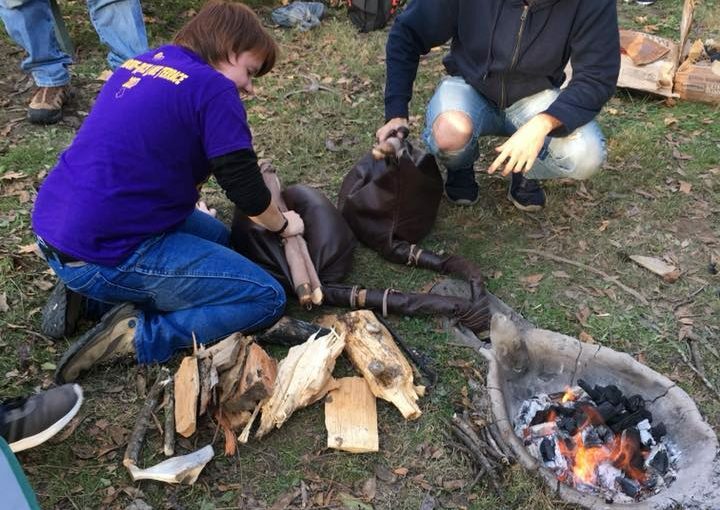 On November 1-3, 2017 I was in Macomb, Illinois leading a bronze casting workshop at Western Illinois University. This was the first event of its kind for the University and few people there knew what to expect. 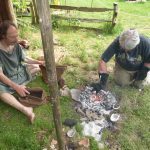 While the archaeology program provides for a certain amount of flintknapping and some pottery done by students, there was no available program for the introduction of the method and theory behind experimental archaeology. Professor Andrea Alveshere, a colleague of mine from the University of Minnesota and I discussed the possibility of my coming to give a short seminar and workshop. There wasn’t much in the way of funds for the project, so I agreed to come as long as my expenses and materials were covered. It was a program that both she and I very much wanted to introduce to the university. I had a long train ride from St Paul to central Illinois, but enjoyed seeing the landscape. I arrived fairly late that evening and was taken to cabins on rural property now owned by the university. The land and cabins had been bequeathed to the university and they are a great resource. In addition to dorm-like cabins with bunk beds, bathrooms, and limited kitchen facilities, there is a dining hall with a complete kitchen. We made sure that there were supplies for coffee and breakfast and checked out the site where we would build the furnace. The grounds around the cabin are level and grassy, and there was already a large firepit with picnic benches arranged around it. I met the site manager, and we chose a spot beyond the firepit where we could construct a small pit furnace. She was excited about the project and had no problems with holes being dug. She also liked the idea of the furnace being buried when we were done with it so that it could be excavated later. We hit the ground running on Thursday. Andrea picked me up and we went to the university where I met students and staff in the art metals department. They were excited about participating in the project and were glad to provide us with supplies. The idea of primitive casting was fascinating to them and they looked forward to the event. I borrowed some tongs and other equipment from them, with more to be delivered the next day. While we spoke, one of the professors who teaches pottery came in. We needed clay, and I had to explain that we wanted his worst stuff, the stuff that’s scraped off tables that’s usually discarded or sent for recycling. He didn’t quite understand why we wanted the useless clay, but he said that we could have as much as we wanted. After lunch we made a run into town for more supplies. We found bags of sand and proper lumpwood/natural charcoal at the local farm store for a reasonable price. 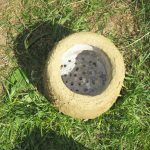 The plan was to cast into cuttlefish bone since two days was not enough time to make moulds for lost wax casting. Andrea had ordered cuttlefish bone from a wholesaler, but unfortunately when the shipment of arrived it contained packages of aquarium gravel. So we were also scouring local pet stores for cuttlefish. Andrea contacted the company she ordered from and arranged an overnight delivery, but there were no promises that it would arrive in Macomb in time. The nearest FedEx office was in Peoria and it would have to go by post from there to Macomb. We agreed to meet up at the site at 2:30 to build the furnace. When we arrived, a few students were already on site. I explained to them about clay mixing and the reasons we mix sand and dung with the clay. In the process they got a basic lesson about ceramic petrography, and early clay recipes. Note the supports for the teapot stand inside. It was a well made and durable furnace. By the time we were done they had a working knowledge of clay bodies and the physical experience of working with it as well. A hole was dug and then it was lined with clay. 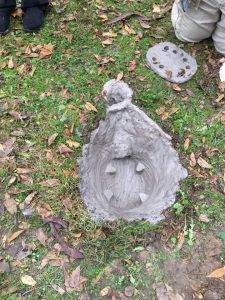 I explained about tuyeres and used a branch to construct a clay-lined hole that ran from the top edge to the base of the furnace. When I build a furnace I usually ask the students to decorate it in some way. Usually something is put above the hole where the tuyere comes in. While working, the students decided that the furnace should have a turtle head above the tuyere. A nice choice, since the glowing charcoal would make for an interesting turtle shell! 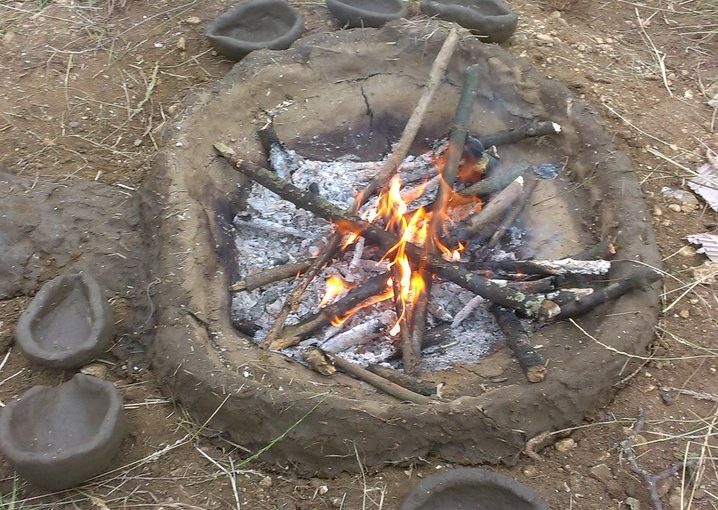 While they worked on that, I made the platform (also known as teapot stands or perforated clay slabs) to place in the furnace. By 6:30 pm we had everything done. That was right on time since I needed to change clothes for my talks at 7 pm at the university. Once I was cleaned up Andrea took me to the lecture hall. It was a great facility with a large wall-sized screen and auditorium seating. It was almost half full, which was good considering that it was a weekday evening and the subject was unfamiliar to most people. Despite that we drew attendance from the anthropology and art departments, in addition to members of the local archaeology society and members of the public who were not associated with the university. I gave three short talks in succession with questions and answers after each one. These were all presentations that I’d previously given at conferences, all of which were about 15 minutes long. I started off with the one I gave in Oslo about the significance of mistakes and how they are preserved in metalwork. The second was about Minimum Tools Required, a portion of my PhD thesis that organised the chaîne opératoire of metalworking. The final talk was about excavating metal, based on the BAJR guide that I’d written. The questions were enthusiastic and despite there being little in the way of prehistoric metal in the region, there was interest in the subject. I did answer a couple questions about Lake Superior copper use among Native Americans. 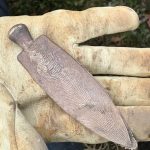 There is some debate as to how some of the copper objects arrived in central Illinois from northern Minnesota. 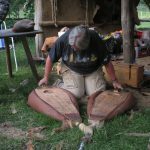 Were finished objects traded by Native Americans, was the raw material transported and traded, or was the copper a chance find of raw material that had been redeposited in southern Illinois by glacial action? I hadn’t seen the objects, but typology might provide a part of the answer. At the end I spoke a little about what we would be doing the next day. Afterwards Andrea and I returned to the furnace. Although it was still damp, I wanted to get it dry before casting the next day. We laid a little fire and sat talking late into the night. The presentation had been a great success and it looks as if it generated a lot of interest. 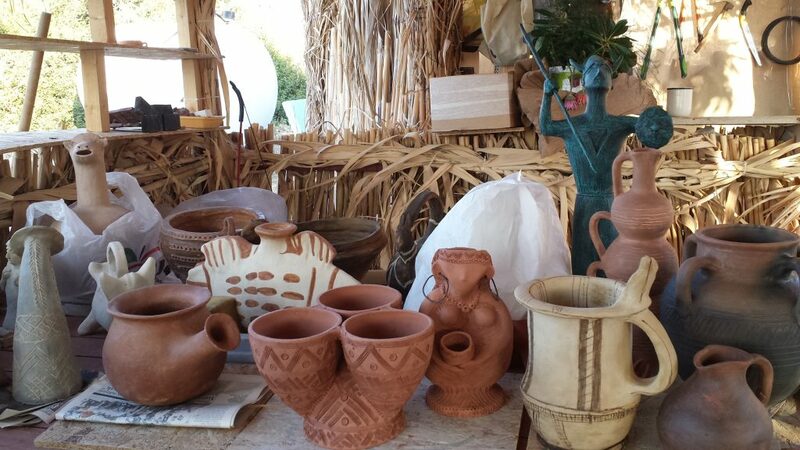 Friday I was scheduled to give a talk on experimental archaeology at noon. 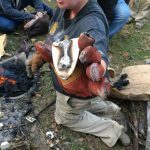 This was basically an introductory lecture about why and how experimental archaeology is done, along with the basic ground rules for doing experimental work. Word had gotten out and the room was filled to capacity. After the talk we headed back to the site and got to work. Because we hurried the process along last night there were a couple cracks in the furnace, but because it was set into the ground the cracks had little effect. 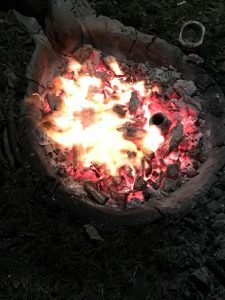 The furnace was still warm from the previous night and I used a trusty pig scapula to scrape out the ash and leftover charcoal and then fit the platform in place. The fire was lit and after I had worked the bag bellows for a bit, the students took over. Every group I work with seems to have a different approach as to how to operate the bellows. I know that the way I do it, alternating pumps with one per hand, is difficult to coordinate for many people trying it the first time. Some people never quite get it and just pump both the bellows at the same time (affectionately known as the Cambridge Method). Here, the students teamed up and had one person per side, operating the bellows with both hands. They were surprisingly well-coordinated. The students were energetic and worked long sessions without tiring. At times I had to ask someone to give up their place to let another student try. I wanted to make sure that everyone who wanted to (including non-students who had come to see what was going on) had a chance at the bellows. The furnace took a bit longer to get the first crucible of metal melted than it normally does because of the frequent changes of personnel pumping the bellows, but we did get there. About an hour after we started Andrea got the call that the cuttlebone had arrived. Students were already carving moulds from what we had on hand. Now things were in full swing. I was grateful to the jewellery professor who took on showing the students how to prepare and carve the cuttlebone while I supervised the melts. I hadn’t noticed that I was still wearing my coral earrings from the lecture! There were a few failures due to improper mould preparation. It gave me the opportunity to explain how easy it was to lose droplets of metal while casting and pointed out the debris that was getting trampled around the furnace, tell-tale clues that an archaeologist needs to look out for in a site that could be mistaken for a cooking pit. Every experience that day was a teaching moment. Both instructional and non-discursive. 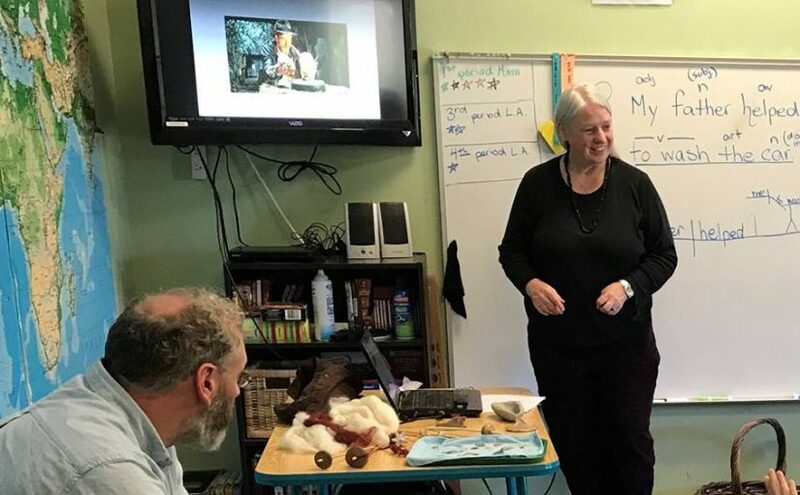 Repeatedly students told me that they had never known that there was such a thing as experimental archaeology, and that they were thinking about archaeology in a new way. A couple students who had not yet declared were suddenly thinking about the possibilities of having a major in anthropology. The students wanted to keep going despite a large pot-luck dinner that had been prepared, so we all went to eat in shifts. When I took a break, people assured me that I wasn’t too soot covered, although I felt as if I had charcoal smoke in every pore. The head of the Anthropology Department came up and complemented me on my lecture. He was impressed by how I presented the information and noted the enthusiasm of the students. The potluck was also attended by members of the local archaeology society who aren’t formally a part of the university, but attend functions and often work with students on projects. We had a great time talking about local archaeology and experimental work. After dinner we worked a little more, but it was long past the time that we could see well in the dark. We packed up as much as we could find and put it all in the cabin. Blowing off the bits of charcoal before pouring. Always exciting! I had the choice of leaving on Saturday or Sunday. I opted for Sunday because the train left at 7 am and I knew that Friday would be a late night. I told the students that if they were interested, we could continue casting on Saturday. I had no lectures or other plans, so we agreed on a 10 am start. The next morning we had another good-sized group of students. The previous day there had been close to a couple dozen people in the afternoon and rarely fewer than a dozen visiting throughout the day and evening. Saturday was more relaxed, but still well-attended. Students made moulds and instructed new participants who hadn’t been there the day before. The more experienced ones were already taking on tasks like they were old hands at it. Andrea was amused that this was supposed to be my day off, but instead it was another full day of casting. Some experimentation was done with hammering (using my bronze hammer and anvil) and other finishing work. 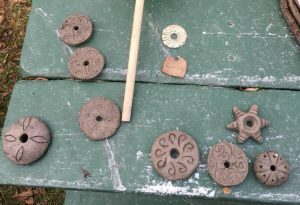 One student was keen on textile archaeology, so she cast some beautiful spindle whorls. I also made some clay ones with her, using some of the scraps left over from building the furnace. Once dry, she’ll take them to the art department to see if she can get them fired there. I heard that they also do raku pit firing. Clay, pewter, and bronze spindle whorls. 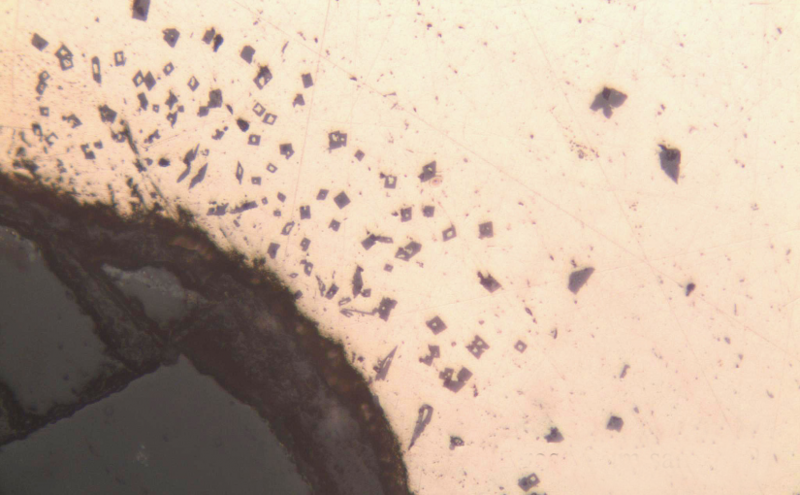 experimental Bronze Age metallurgy meets textile archaeology! Towards evening I needed to call it quits. I had an early start in the morning and needed to get things cleaned up and packed. The students reluctantly poured the last moulds and we got everything in order. The next day they would cover the turtle furnace with dirt and let it deteriorate. Left to itself, it should be covered in grass in a year. In a year or two it will be just as useful as a teaching tool for excavation. The entire event was successful and exceeded our expectations. We had brought an entire new perspective on archaeology to the department, and the department heads were impressed. In my talk I had emphasised the value of programs like this not only for hands-on student learning, but also as a unique opportunity for public interaction with the department. Too often universities are segregated from the surrounding community leading to the local residents wondering what goes on there. 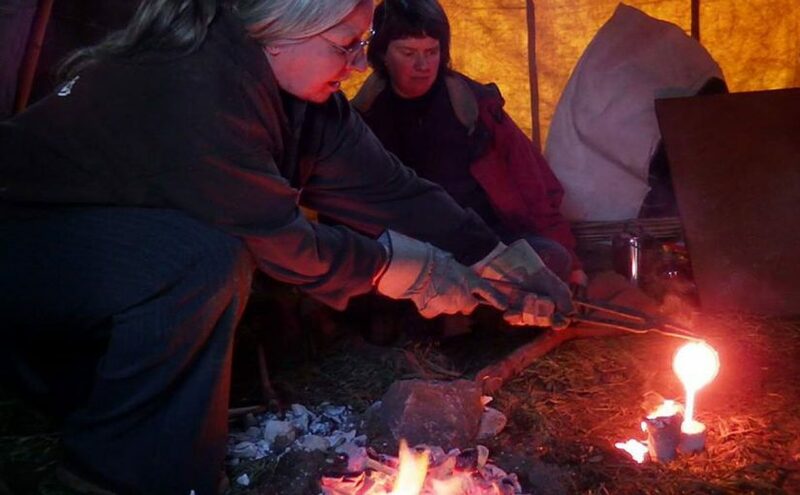 Experimental archaeology programs, especially those performed out of doors, provide an opportunity for interaction and public participation, and even drawing on experience of people from outside the university. Andrea and I discussed the possibility of doing a longer workshop or even the possibility of an accredited short course. Now that the department has been given an idea of what can be accomplished, they might be more amenable to funding it. These are ambitious ideas in a time when universities are hurting for money. 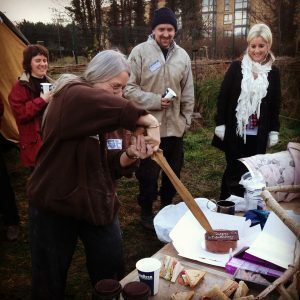 I was glad to be a part of this mainly because I wanted to help Andrea introduce experimental archaeology to her students and colleagues. There was no budget for such an unknown project, but because we were keen on this, Andrea scraped what funds she could get at short notice and we put it together on a shoestring. 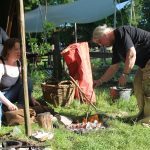 I would love to pursue this and give students the full range of what an experimental archaeology course could offer, but that is for the university board to decide. In the meantime, I would like to thank all the people who support my project on Patreon. 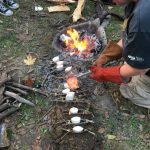 They provided the opportunity for this seed to get planted and for students to have a unique experience that will benefit them in their careers as archaeologists. 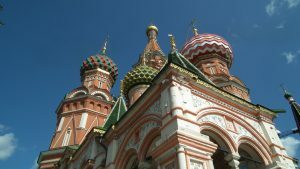 The contributions made through Patreon and PayPal go towards giving more people the opportunity to explore the world of material culture in a way they never realised before. If you’re interested in finding out more about my Patreon project or making a sustaining contribution please click on the link below. In March 2017 I had a great time talking to the students at Cyprus Classical Academy about what archaeologists do. Cyprus Academy is a Montessori school in which classes are organised by ability rather than age. The students I spoke to ranged in ages from 6 to 11. 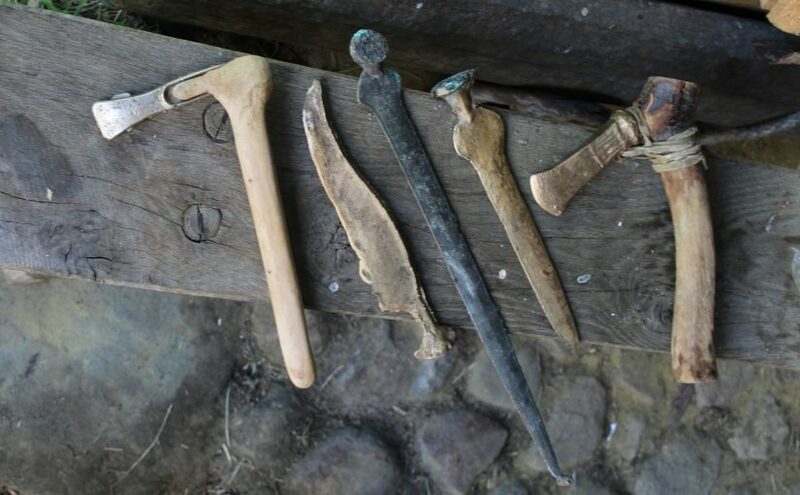 This is a great age for kids to learn about prehistory and the fascinating story of how people invented tools and developed crafts. The students had a chance to look at and handle artefacts, pump a set of bag bellows, and have a go at using a drop spindle to spin some wool. They will continue on studying prehistory and history, but I doubt they’ll ever think about ‘cave men’ the same way again. Apparently one of the teachers was amazed by finding out that Neanderthals made flutes and had music. One of the unexpected benefits of my talk was that a girl in the class was excited to know that there are women archaeologists. 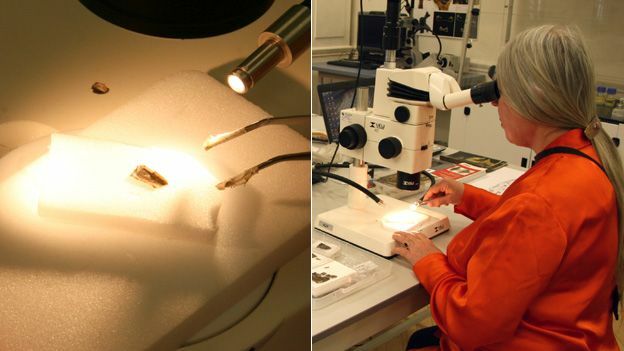 There is the popular perception that archaeologists are men, and while field archaeology tends to have more men excavating, I pointed out that women also excavate, and also work in labs and museums. I included some slides showing kids volunteering cleaning finds, to let them know that there’s a place for them in archaeology too. 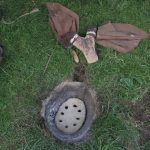 Sedgeford Archaeology: Metallurgy and more videos! 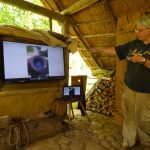 In the summer of 2014 I had the pleasure to assist Dr Eleanor Blakelock in running week-long seminars in archaeometallurgy and experimental archaeology at the Sedgeford Historical and Archaeological Project (SHARP) in Norfolk. 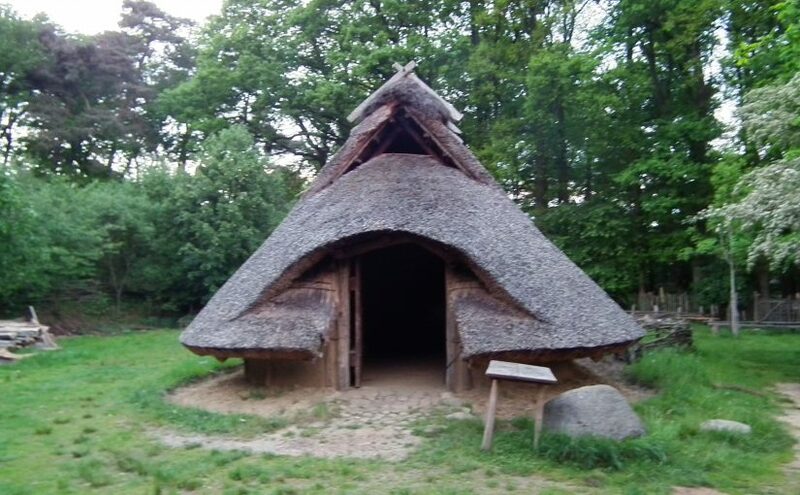 The current excavations are focused on two areas of an Anglo Saxon village, however their “primary objective is the investigation of the entire range of human settlement and land use in the Norfolk parish of Sedgeford”. The excavations have been going on since 1996, and the organisation provides comprehensive teaching in a wide area of archaeological subjects. You can read all about the project here. 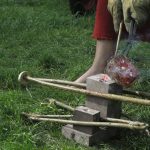 The previous year SHARP began a new course in archaeometallurgy. Ellie wanted to expand the course, so I lent a hand with some of the hands-on and experimental work. 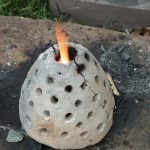 We built furnaces, made moulds, crucibles, mixed alloys, and cast bronze. We even got some local ore to smelt iron. It was an intensive week and the hottest one I have ever experienced in England. During the event, Ellie took some videos of us in action. The first one shows us building a pit furnace for casting bronze and a pit for heating the moulds. The video then follows us through the casting process. One interesting phenomenon of the week was how we became separated from the rest of the SHARP community. We were given our own space that wouldn’t interfere with the the trenches or the campground, and was not archaeologically sensitive. The first two days when we were building furnaces we kept to the same schedule as everyone else. However, once the casting began we couldn’t stop for meals or keep to the schedule that everyone else had. One of our group would go down to the mess tent and bring back food for the rest of us. We were effectively isolated, although the others always knew where we were from the rising smoke. Later when we started showing up with freshly cast bronze jewellery there was a bit of envy and wonder. In the space of a couple days we had gone from being part of the community to the people who were “over there” with special knowledge, and who didn’t conform to the regular schedule or tasks that everyone else did. 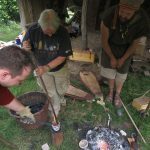 We kept odd hours, were continually covered in soot, but had become somewhat wizard-like in our knowledge of metalworking (not to mention regularly getting out of kitchen chores!). On the final evening, everyone joined us for the iron smelt. The week had been intensely hot so we started stoking the bloomery furnace in the late afternoon, after the heat of the day. As the sun set and most folks had finished their supper, they came by to see the furnace in full swing with fire shooting from the top. Of course everyone wanted to take a turn at the bellows. It was a magical evening. Stories were told, and mysteries presented. The people who worked on the furnace and participated in the smelt had a new appreciation for the process of making iron. 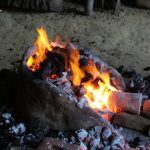 The archaeologists also had a more rounded knowledge of what a smelting site could have looked like, including the resources needed for smelting iron, and the physical space that people would have inhabited while at work. It was past 1 AM when we finally called it quits for the night and let the furnace cool. 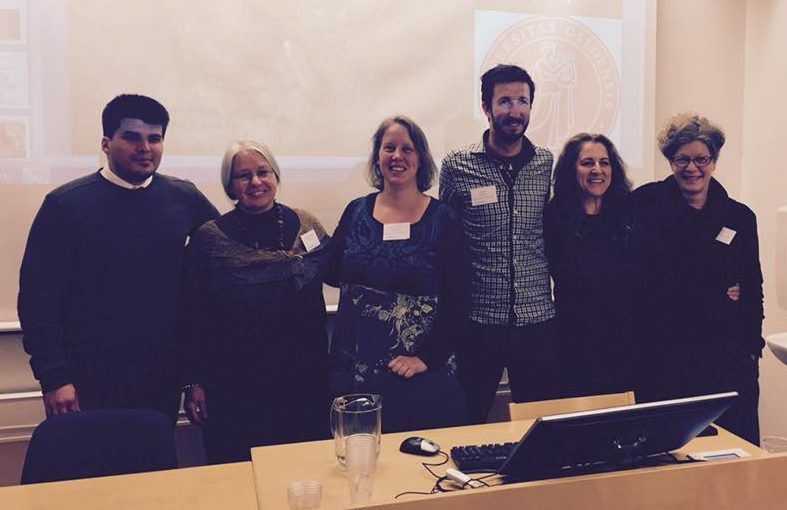 In a way the course was an initiatory experience for the archaeologists who participated in the event. It was hard work, but they learned the secret knowledge of the smiths and have stories and their bronze castings to prove it. They also gained a well-rounded introduction to archaeometallurgy that included both theory and practice. I have been back to help run the course and plan to be there again this summer. The course will run again this July. If you’re interested in learning more about the course or being part of the excavation please sign up on the SHARP website. 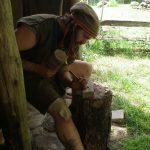 Posted on 26/03/2015 04/03/2018 Categories About me and my workTags archaeological metals, archaeological theory, archaeology, archaeometallurgy, bloomery, bloomery furnace, bronze casting, casting, experimental archaeology, furnace, furnace design, furnace making, iron bloom, iron smelting, metal casting, non-ferrous metal, non-ferrous metal casting, Norfolk, Sedgeford Historical and Archaeological Project, SHARPLeave a comment on Sedgeford Archaeology: Metallurgy and more videos!